Whatever your topic, Artful Thinking provides options for thinking about it. Perhaps the most useful part of the website is the explanation of Thinking Routines for each disposition. Not sure how to get students to Observe and Describe? You could try the Elaboration Game, in which groups of four students take turns observing and adding details to the observation. The website describes the game using an artwork, but it would work as well for a primary resource in history or a collection of leaves in science. Or perhaps you’d like to use the Ten Times Two routine, in which students choose ten words or phrases to describe a picture, object, or artifact. Then they stretch to choose ten more. Think about how that could be used in literature. “Find ten words or phrases that tell you about Jane’s attitude at this point in the story.” Then, “Find ten more.” The exercise of selecting (and then defending) words that define Jane’s perspective can be an excellent exercise in using evidence from a piece of literature to support an idea. Common Core, anyone? But those are just the beginning. In particular, the routines about Exploring Viewpoints, Questioning And Investigating, and Comparing and Connecting, build toward divergent and flexible thinking. The routines are clear, brief, and easy to use—just the thing for getting the school year off to a thinking start. 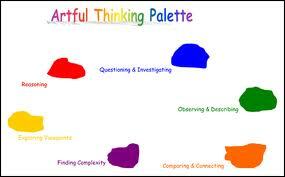 They even have examples of Artful Thinking across curriculum areas, so you can see how it can work in your subject(s). Explore the website and imagine how it could work in your class. We’d love to see the creative uses you find!